Ever since Keith and Ross Smith's triumph in 1919, the England-Australia record has been considered the pinnacle of achievement in Australian aviation record-breaking. 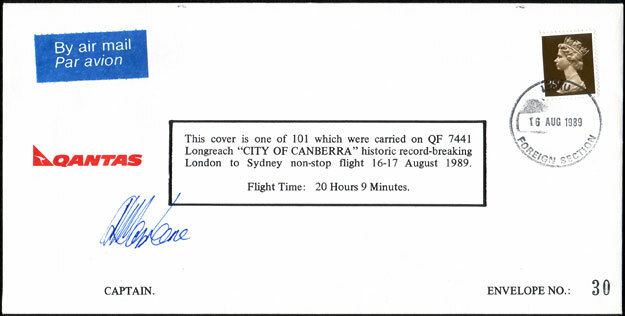 In 1989, the delivery flight of Qantas Airways' first Boeing 747-438, VH-OJA City of Canberra, presented the airline (still, at that time, 'Australia's interational airline') with an opportunity to claim the record with a spectacular and still unequalled feat - the first ever non-stop civil flight between the two countries. The flight took place on 16-17 August 1989, a few months short of 70 years after the Smiths set out. In order to maximise range, a special high-density fuel was used, the tanks were filled to overflowing and the aircraft was towed to the runway holding point before starting engines. The engines themselves were specially chosen examples. Although the aircraft was fully fitted out inside, to save weight all non-essentials, such as galley equipment, were removed. The flight departed London/Heathrow under command of Captain David Massey-Greene, Qantas Boeing 747-400 Project Pilot, with a flight crew comprising Qantas Captains Ray Heiniger, Rob Greenop and George Lindeman, with Captain Chet Chester from Boeing. In addition to the five pilots, there were two cabin crew and sixteen passengers aboard for the planned 19 hour 52 minute flight. As seen from the ATS flight notification below, the aircraft's planned route took it from London to Frankfurt, then Istanbul, Ankara, Tehran, Oman, Colombo, Cocos Island, Carnarvon, Meekatharra, Woomera, Cowra and finally Sydney. Interestingly, Qantas designated the flight as 'QF7441', but the flight notification was filed as 'QFA741' (QF is the IATA designator and QFA the ICAO designator for Qantas). The aircraft appears to have operated as 'Qantas 741'. Note also the early ICAO designator for the new Boeing 747-400 - 'B747F' (later 'B744'). The flight itself proceeded relatively uneventfully, but required continual monitoring of wind, temperature, fuel burn and the weather at Sydney to ensure that sufficient reserves remained. Unexpectedly strong headwinds as far as Cocos Island meant that fuel was very tight, but from Cocos onward a tailwind slightly stronger than forecast enabled them to 'make' sufficient fuel to complete the planned flight. 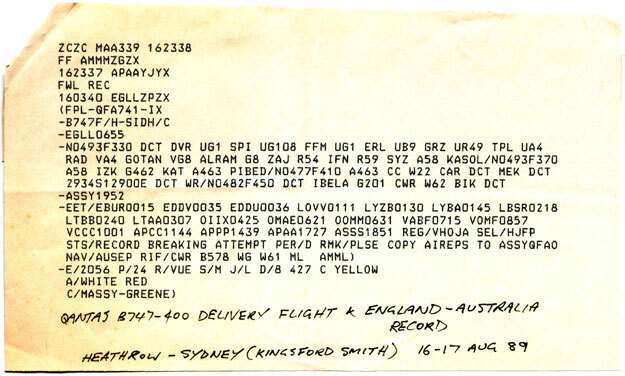 The AIREP below, transmitted as the aircraft crossed the Australian coast at Carnarvon, WA, indicated that the crew calculated that they had 4 hours 12 minutes flying time and 5 hours 20 minutes fuel remaining (although this latter figure does not take into account the fuel required for an approach). In the event, the aircraft landed in Sydney after 20 hours 9 minutes flying time with 5.6 tonnes (or just over 45 min) of fuel remaining of the 183.5 tonnes they had on board out of London. In addition to the point-to-point speed record, VH-OJA also set an unrefuelled distance record of 17,039 km, only bettered in 2005 by Boeing with a 777-200LR. In order to raise money for charity from the flight, 101 special air mail covers were carried on the flight: the one illustrated below is number 30. The covers were all postmarked at the LAMU (London Airport Mail Unit) Foreign Section on 16 AUG 1989 on a 35p QE II stamp, and backstamped at Sydney International Airport on 17 AUG 1989 on a 39c 'Living Together' stamp. This cover is signed by Captain David Massey-Greene. After the flight eleven covers were distributed to participants in the flight and the remaining 90 were auctioned by tender for charity. Prior to its delivery to Qantas, the City of Canberra previously wore the Boeing 'trade plate' registration of N6046P for flight testing. The aircraft went on to long service with Qantas, the photo at the top of the page showing it on approach to Melbourne's Runway 34 on 19 February 2008. 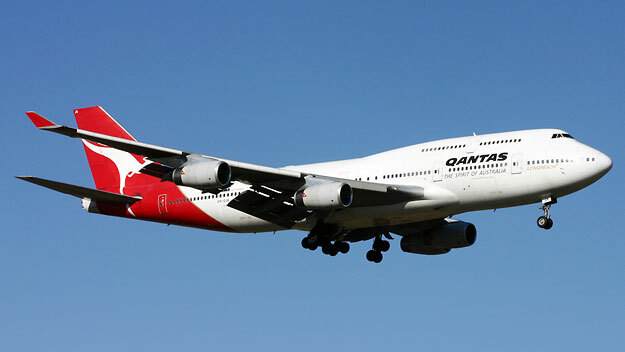 The City of Canberra also went on to be the lead ship of a Qantas fleet that would eventually total 24 Boeing 747-400s, plus another 6 -438ER longer-range versions. Qantas also gave the B747-400 fleet the type name 'Longreach', at once recalling both this incredible flight and their historical roots in central Queensland. Two years prior to the Qantas record, the British Royal Air Force set an England-Australia speed record that still stands - click here to read about it.